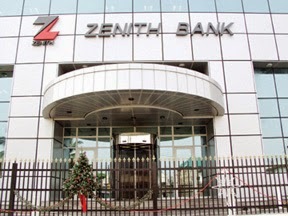 Uneasy calm and general apprehension have gripped the management of Zenith Bank Plc, following the reported refund of $16million out the $20billion allegedly stolen from the coffers of the Nigeria National Petroleum, NNPC by the management of the corporation. Sanusi Lamido Sanusi, a former Central Bank of Nigeria, CBN Governor, now Emir of Kano, was replaced by Godwin Emefiele as central Bank Governor after he (Sanusi) allegedly raised an alarm over the non remittance of $20 billion oil money to the treasury. He was to be replaced by Emefiele, who was the managing director of Zenith bank before his appointment. With the conclusion of the 28 March presidential election in Nigeria which President Goodluck Jonathan of the People's Democratic Party, PDP lost to the Major-General Muhammadu Buhari (rtd.) of the All Progressive Congress, APC, embattled petroleum minister, Ms. Deziani Allison-Madueke, has since commenced on a shuttle between Nigeria and abroad. According to a security source who pleaded anonymity, General Abdulsalami Abubakar, Nigeria's former head of state pleaded with General Buhari not to prosecute the petroleum minister, a situation which led to the refund of $16milion last week, which was allegedly traced to Zenith Bank. According to sources, the appointment of Godwin Emefiele as the CBN governor may not be unconnected to the sordid transactions between the bank and the Jonathan led administration. Sources within the presidency told our correspondent that Ms. Allison-Madueke had allegedly masterminded Emefiele's appointment and even handpicked him to occupy the post in a bid to cover up her shady deals. Several calls and text messages sent to the embattled minister to get her reaction did not yield much fruit as she has refused to pick her calls.